Limited edition print of 30 pieces. 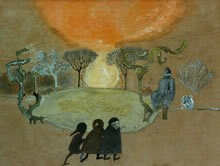 This painting was featured in A Tolkien Tapestry, Pictures to Accompany The Lord of the Rings on page 129. Signed and numbered to 30 by Cor Blok (under the image as usual with numbering on the left, title in the middle and signature on the right).